The cushioned, rotating cradles on this rack can accommodate bike frames up to 2" in diameter, and an integrated lock provides security for your bikes. A tilting mechanism at the base offers easy access to your vehicle's rear cargo area. 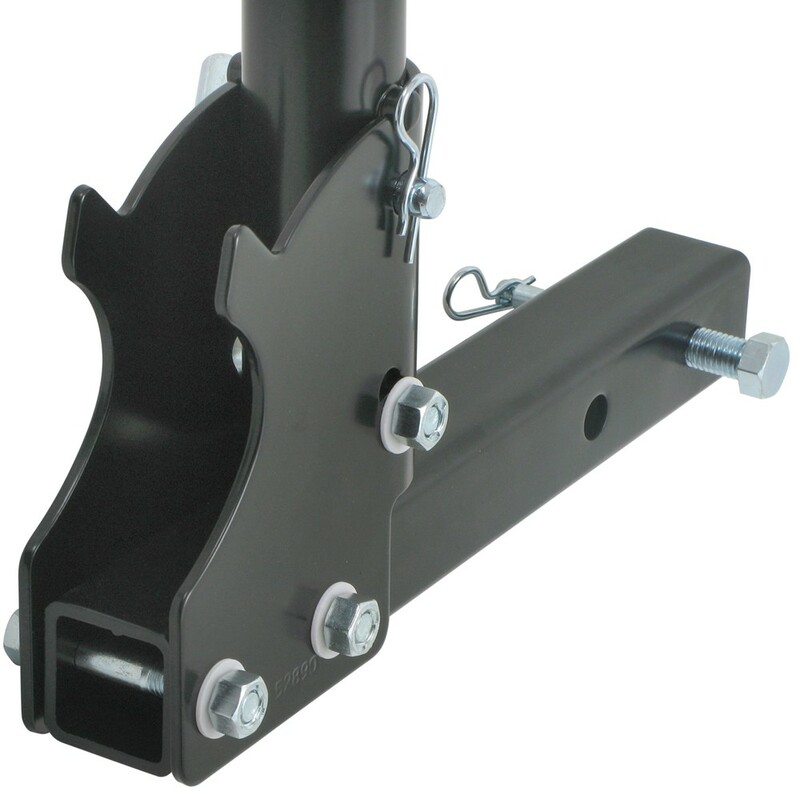 Call 800-298-8924 to order Swagman hitch bike racks part number S64970 or order online at etrailer.com. Free expert support on all Swagman products. 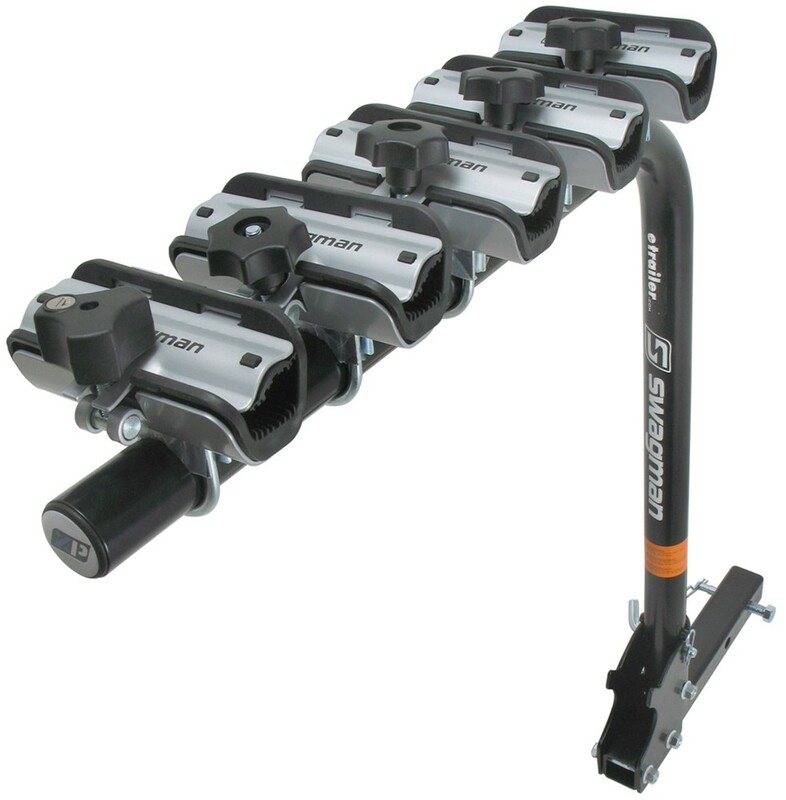 Guaranteed Lowest Price and Fastest Shipping for Swagman XP - Folding 5 Bike Rack for 2" Trailer Hitches. Hitch Bike Racks reviews from real customers. The cushioned, rotating cradles on this rack can accommodate bike frames up to 2" in diameter, and an integrated lock provides security for your bikes. A tilting mechanism at the base offers easy access to your vehicle's rear cargo area. This carrier's steel construction provides lasting toughness and carries up to five bikes. Cushioned cradles on the arm rotate to keep wheels level to the ground, providing improved ground clearance. Additionally, the cradles help provide a scratch-free ride for bikes by using thick kraton vinyl cushioning with large grooves, which prevent bike cables from rubbing on the frame. They also work to prevent bikes from rocking back and forth during transit. 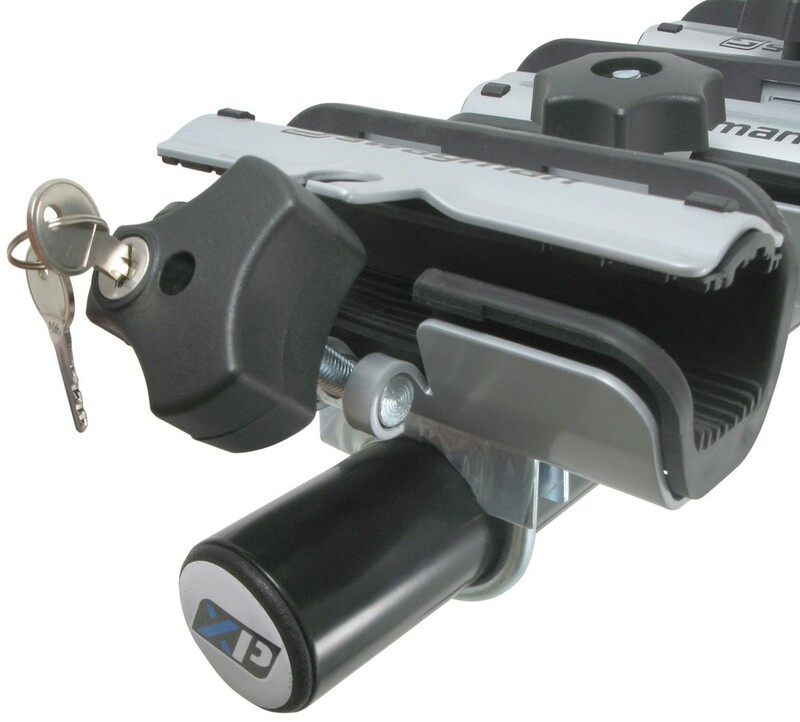 The cradles accommodate bikes with up to a 2" diameter frame, and the locking knob allows for a secure and quick unload. The rack also tilts forward to allow easy access to the vehicle's rear cargo area. The tapered dual arms on this rack let you carry your bike and the kids' bikes at the same time, reducing the need for an adapter. Anti-sway cradles provide a secure hold. Tilting mast lets you access cargo area. Anti-wobble hitch pin included. Premium, powder coated steel hitch bike rack offers hassle-free bike loading with fold-up anti-sway cradles and ratcheting straps. Cradles are set 7" apart so bikes won't become tangled on the rack. Includes locks for bikes and rack. 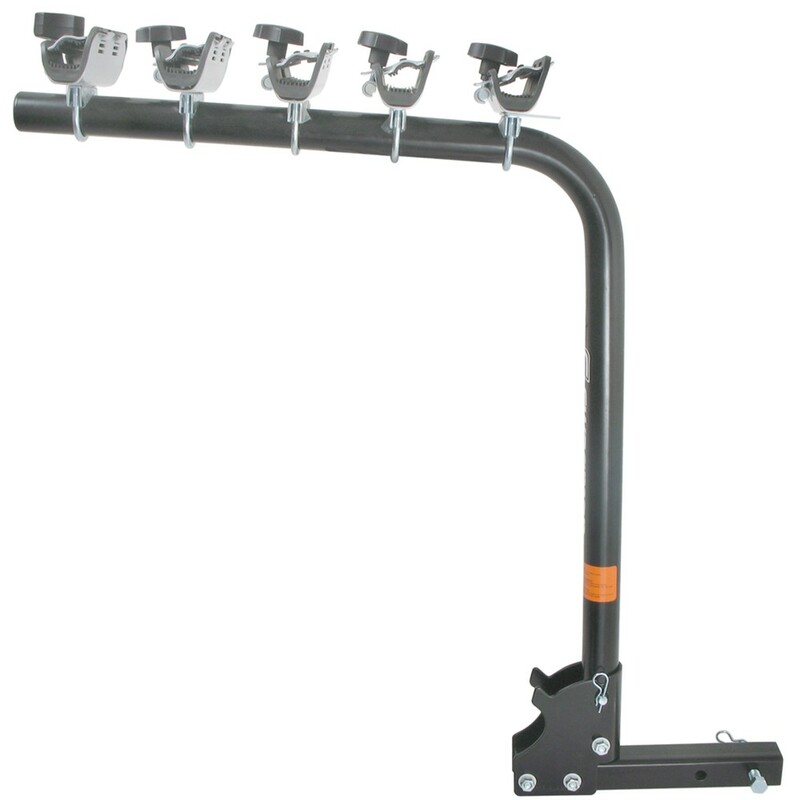 Hitch-mounted rack carries 5 bikes on folding arms with easy-to-adjust anti-sway cradles. ZipStrip ratcheting straps quickly secure bikes to cradles. Rack tilts for cargo area access. Tool-free installation with locking knob. Includes cable lock. Order: RelevanceNewestRating - High to LowRating - Low to High The cushioned, rotating cradles on this rack can accommodate bike frames up to 2" in diameter, and an integrated lock provides security for your bikes. A tilting mechanism at the base offers easy access to your vehicle's rear cargo area. i actually just put it on again this morning - we love it, i think the only thing i would say is that i wish there was some way to keep it a little tighter in the receiver hitch. the bolt tends to loosen after a bit of driving - nothing unsafe, just makes it sway and bounce a bit more and needs to be retightened. Can all four bikes be locked?? Only one of the 4 knobs needs to be lockable. Use it on the outermost bike. If a thief cannot remove the last bike, he cannot remove the others. Remember, if using an adapter bar, the bike cannot be secured by locking the cradle. A cable lock will need to be used in that case. we have a rav 4 with the swing door 2009 and the spare in the case. We also have a trailer 2 receiver on the rav does this rack work well for our application ? You will need to measure the distance to the from the center of the hitch pin hole to the outer edge of your spare tire cover. 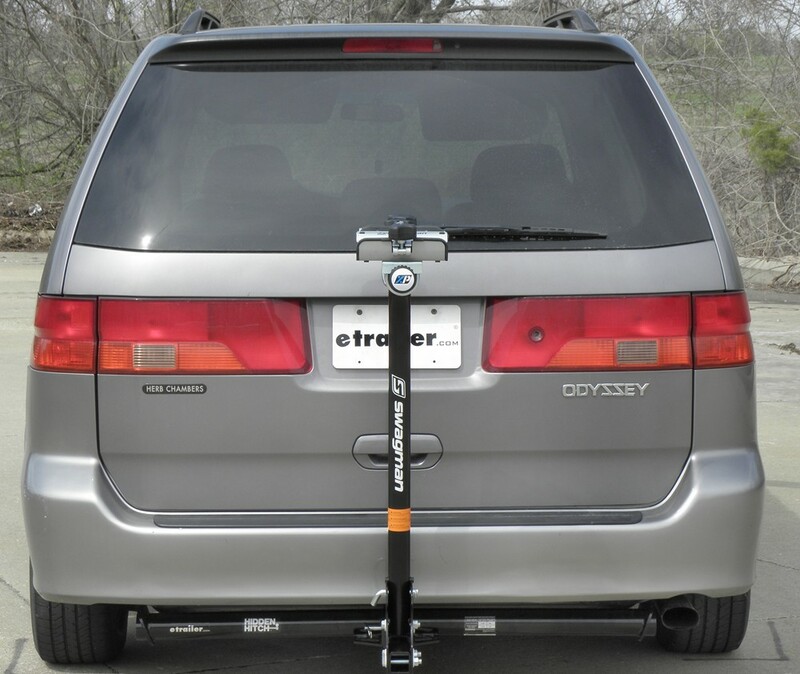 This will tell you how much clearance you will need for the Swagman Bike rack to work with your vehicle. If this measurement is less than 13-1/2 inches this bike rack will work great for you. Works great. No problems at all.Glad i made the purchase.The service etrailer provides is excellent. Still perfect. Our bike trip last July to Montana and Idaho was a great test of the Swagman bike rack. We had four bikes totaling 80 pounds and had absolutely no issues. With the U brace keeping the rack base tight against the hitch, there was no wobbling at all. A great trip was made better by having the peace of mind provided by a sturdy rack to safely transport our bicycles. Thank you etrailer! After one year, this bike rack is still performing very well on the back of our fifth wheel. We have travelled over 5,000 miles with our bikes in tow, and it still looks and operates like brand new. I was able to make four full-size bicycles fit on it, but you have to be creative. How is your hitch fastened to your fifth wheel? In response to Richard N., we had a 2 hitch receptacle installed on the rear of our fifth wheel when we ordered it from the factory. 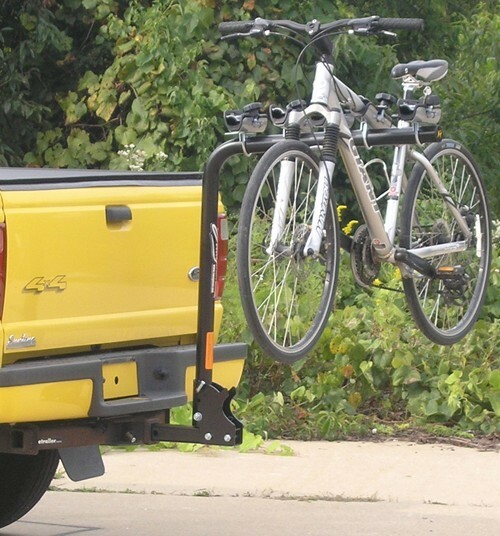 The bike rack is installed by sliding it into the hitch receptacle. Except for the Swagman decal on the bike rack, the unit is working very well. It is worthwhile investment. Ladies bikes have a bit of a non-typical frame for the most part. Mounting them to a rack becomes a lot easier with the use of an adapter bar. It helps to provide a place to hang the bike level on the rack which in turn puts the handle bars where they should be. Check out part 64005. $40.95. Swagman designed for their racks and this kit includes a lock and cable that will lock both the bikes and the rack. 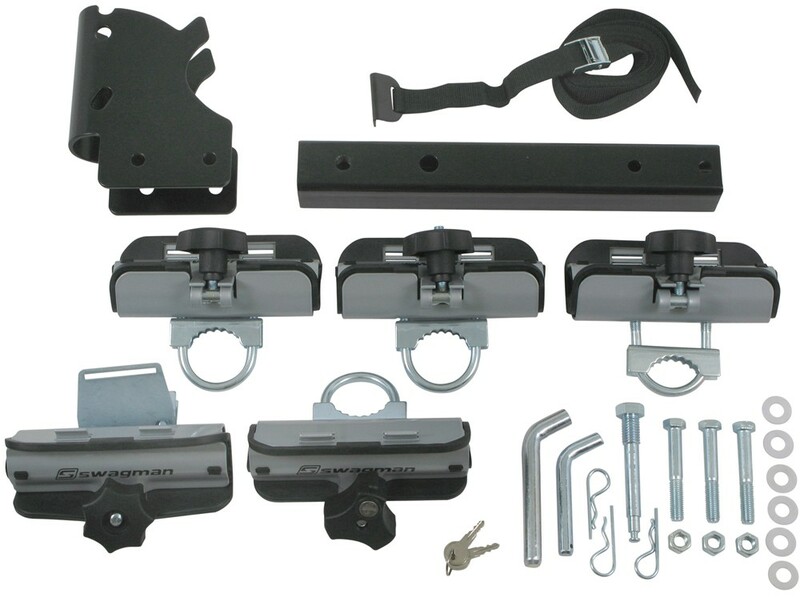 Thank you for describing the replacement part you need for your Swagman XP Folding 5-Bike Hitch Rack # S64970. What you are looking for is a 2-inch shank. I called Swagman to confirm the correct part. What you need is part # SP129T. It sounds like you are referring to the top plate for the Swagman XP Folding 5 Bike Rack # S64970, which is indeed available with part # P161. This includes 1 cradle top plate with the vinyl insert. If you are referring to something else please let me know and I will be happy to see if we have it available. Since you have childrens bikes, which have smaller frames, I would recommend a single arm bike rack that will fit your bike frames easier than a dual arm bike. This hitch will work on a Class III hitch that has a 2 inch opening. 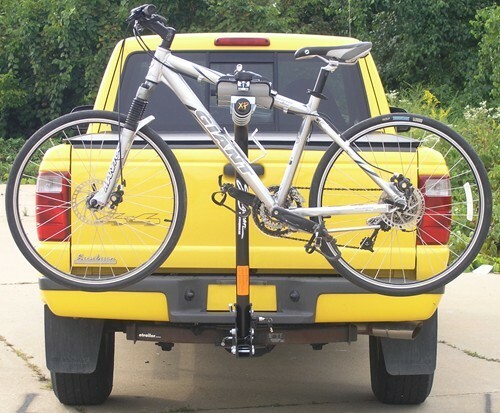 I would recommend you get a Swagman Hitch Bike Rack # S64970. This single arm rack should work well for carrying your childrens bikes. I attached installation instructions for this product for you to check out also. A good 5-bike rack for your needs would be the Swagman XP S64970. The cradles on the bike rack rotate to accommodate many different types of bike frames. Due to their size and weight, 5th Wheel Campers have a lot of movement in the rear suspension. With this amount of movement combined with the weight of 5 bikes, a 5 bike rack could not hold up on the back of a 5th Wheel. Something like the Swagman Standard 4 Bike Rack, part # S64400, is as large as you could safely go on the back of a 5th Wheel Camper. It can carry 4 bikes, up to 35 lbs per bike. 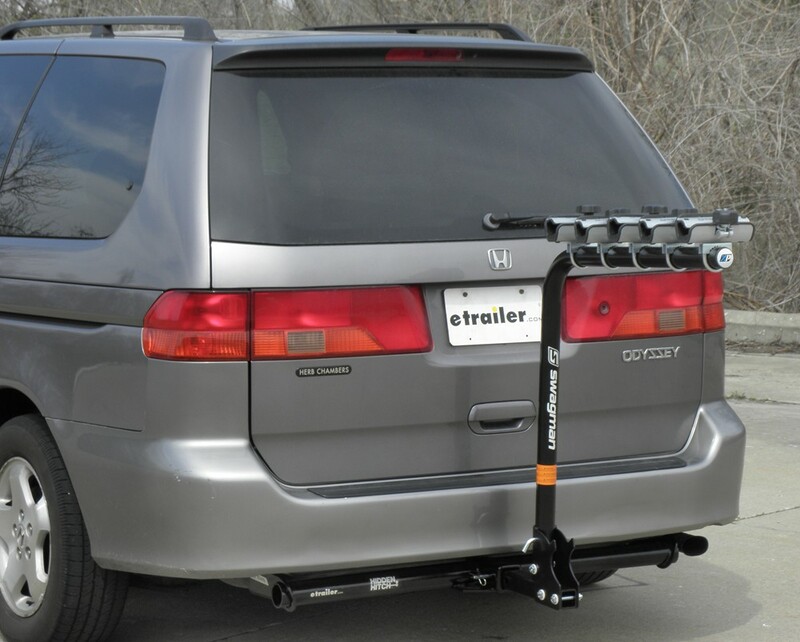 What is the Max Weight of the Swagman XP 5 Bike Rack for my 2001 Honda Odyssey? 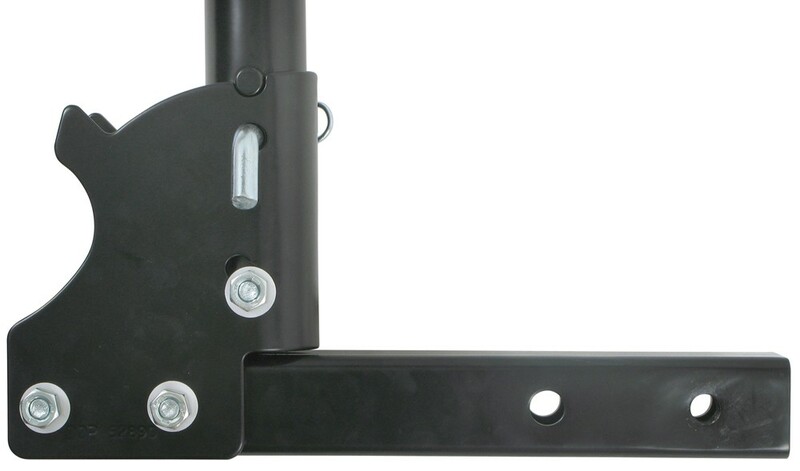 The Swamgan XP 5 Bike Rack for 2 Inch Hitches, part # S64970, does not include a locking hitch pin. You would need to use Locking Anti-Rattle, Threaded Hitch Pin, # S64027, because it is uniquely threaded to match the bike rack. 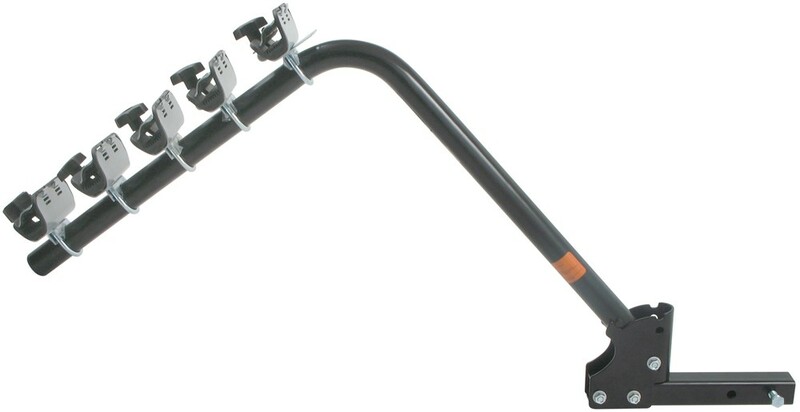 Yes, we have the replacement pads you need for the Swagman Fold Down XP 5-Bike Rack, item # S64970. You will need to order the Replacement Top and Bottom Pad for Swagman XP Cradle, item # P160, and you will get a replacement top and bottom pad. The thick kraton vinyl cushioning in the cradles of the Swagman XP 5 Bike Rack, # S64970, do work to prevent bikes from rocking back and forth during transit. As an additional protection measure, I recommend using Anti-Rattle Hitch Lock and Cable, # S64030, to help prevent bike and wheel movement and to secure the rack to the hitch. I have included a link to the installation details for the rack. We have a few different 5 bike racks, see link, but to handle such a wide variety of bikes I recommend going with the single arm Swagman XP, # S64970. The only bike that might be troublesome is the one for the 2 year old. The top frame tube would have to be more than 7-3/16 inches long to fit on the rack cradle. 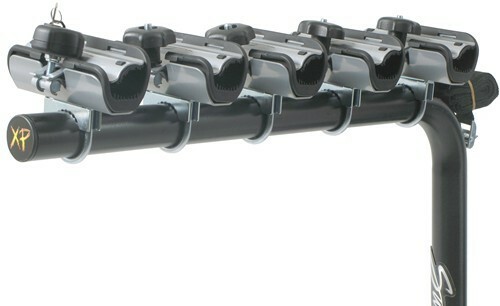 The rotating cradles will allow you to carry the bikes level without the use of an adapter bar. I have included a link to the installation details for you to view. I have exactly what you need. Check out the Brophy Hitch Reducer part # HT02. This a metal hitch reducer that will let you use your 1-1/4 inch bike rack in the 2 inch hitch that is on your 2014 Toyota Sienna.